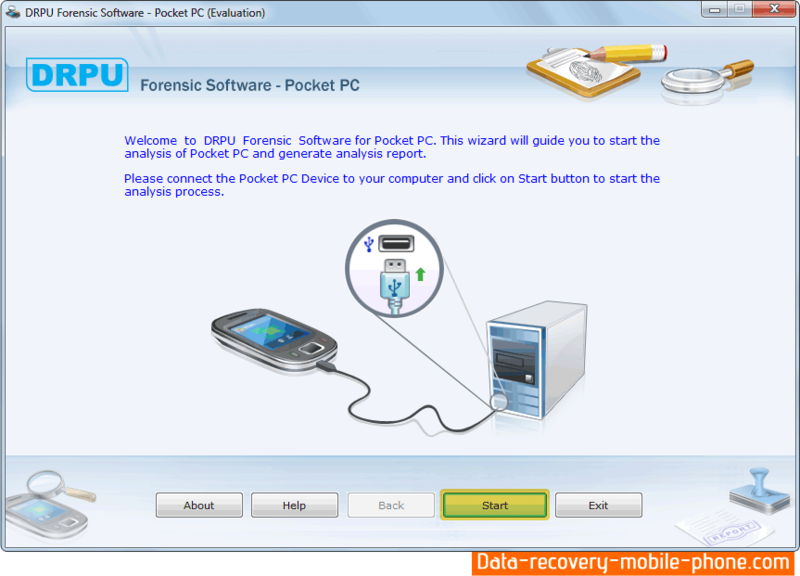 Data Doctor’s Pocket PC forensic tool is used to extract all detailed information of windows based mobile phone and other similar devices. Forensic software analyzes all saved phone book contact numbers and text messages with person name. Investigation tool is used to get relevant information of mobile phone such as mobile model name, IMEI number, database records, operating system registry, phone book, calendar, word lists, images, videos, call history, etc. A detailed case study will provide examples of information that can be found on phones (e.g., Pocket PC forensic utility supports all PDA or smart phone devices such as Anextek SP230, Asus Pocket PC Phone, Audiovox PPC 5050, Carrier Devices i-Mate, Gigabyte gSmart, Hitachi Pocket PC phone, HP iPAQ, HTC TyTN Pocket PC, i-mate, Motorola MPx200, O2 Xphone, Orange SPV E200 smartphone, Palm Treo 700w, Pantech PH-S8000T smartphone, Samsung Pocket PC phone, Sharp W-Zero3 Pocket PC Phone, Siemens, T-Mobile MDA, UTStarcom XV6600, Voxtel W740 etc). Mobile Forensic Software analyzes files and folders, database, operating system registry details and phone information of Pocket PC. Extracts information about software and hardware architecture of Pocket PC like OS type and version, Processor architecture, Memory usage and related information. Software copy all file contents to the computer in similar hierarchy of Pocket PC. Analyzes complete phone information and extracts PhoneBook number, Appointments, Task, IMEI number, SIM Information, Contact details, Phone Model, Manufacturer details and other related information. Software generates various types of reports of analyzed information on user choices. Analyzed information can be saved to the specified location in hard disk drive of computer.